Prohibitory order imposed on Togadia by BJP Govt in Assam…. Capture land from B’desh to settle immigrants: Antarashtriya Hindu Parishad (AHP) President Pravinbhai Togadia. Thousands of Hinduwadi attended Dr Togadia’s rally violating the prohibitory order. But, Dr Togadia met them with a piece of black cloth tied upon his face. 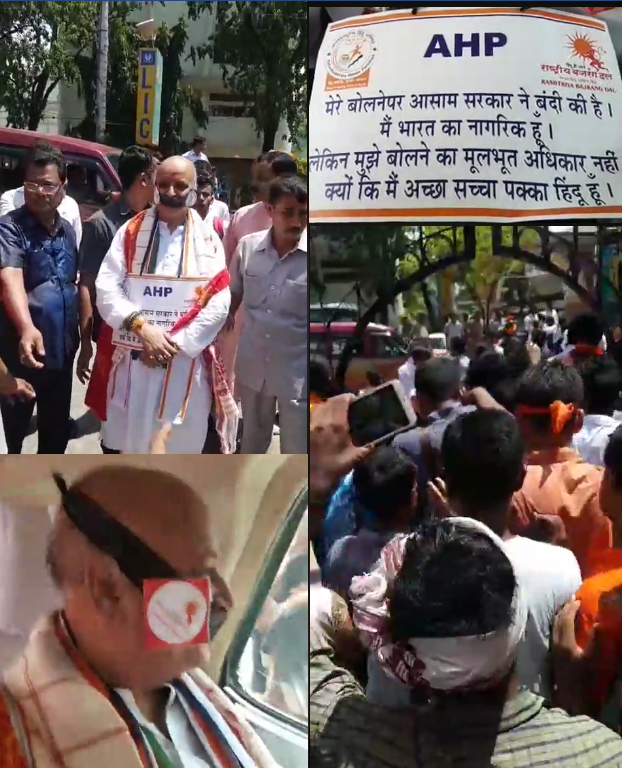 Upendra Bharti | HENB | Guwahati | July 18, 2018:: Dr Pravinbhai Togadia, President of newly established ‘Antarashtriya Hindu Parishad’ (AHP), has mooted that the Indian Army should capture Bangladesh land and settle 50 lakh illegal immigrants from the neighbouring country staying illegally in Assam if that country refuses to take them back. Togadia, who arrived in Guwahati despite the prohibitory order imposed here, addressed the media at Guwahati on Wednesday. “No work permit must be issued to illegal immigrants. If Bangladesh does not accept the 50 lakh people, Indian Army must occupy a portion of land in Bangladesh and settle these people there,” the firebrand AHP leader said. 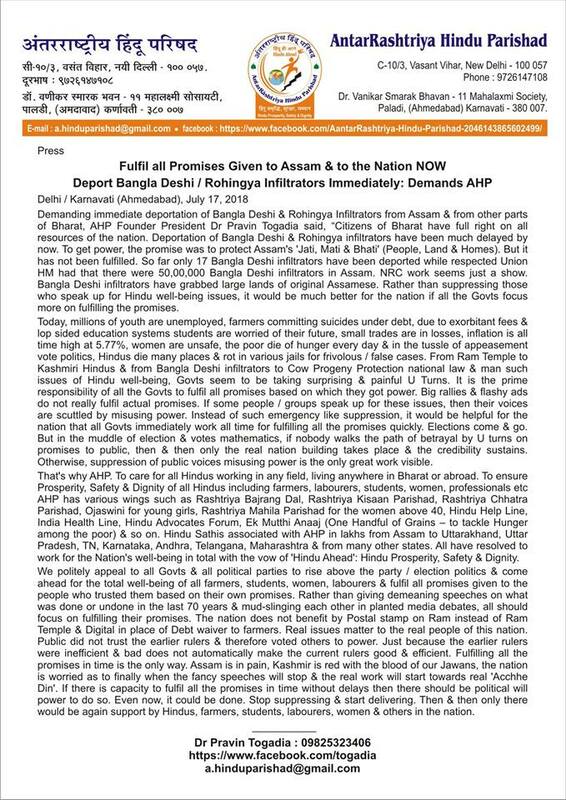 In a press release, AHP demanded the “Immediate Deportation of Bangladeshi/Rogingya Infiltrators” from India and it criticized the failure of BJP run Assam Govt to take right steps to solve the problems of Muslim influx in Assam. AHP also objected the unfortunate stay of Hindus in many detention camps in Assam, treating them equal to Muslim infiltrators. A RSS-VHP combine ousted Dr Togadia from his position in VHP months ago for his out-spoken stand to expose BJP’s anti Hindu and anti-National steps contradicting their election promises in 2014. Now, the scathing attack on BJP and PM Modi by Togadia in many issues put him in a prohibition by Assam Govt which created a mixed reaction by the local Hindu public. Many Hindutwavadi supporters, even from RSS-VHP link came to road in a support for the cause of Dr Togadia in Assam. Even better: send the Muslim migrants to Pakistan. That kills two birds with one stone: we reduce our own problems and we increase theirs. This entry was posted on July 19, 2018 by hinduexistence in Anti-Hindu, Attack upon Hindu Sentiment, BJP menace, BJP Menace on Hindu Matters, Conspiracy against Hindus, Hindu Agenda, Hindu Leadership Under Attack, Hindu Persecution in Assam and tagged Capture land from B’desh to settle immigrants, Pravinbhai Togadia, Prohibitory order imposed on Toadia, Toadia prohibitated by BJP Govt in Assam.